Sikhs in Pakistan hoped that Islamabad would allow them to visit holy shrines in India without any travel restrictions as the leadership of the nuclear- neighbours held peace talks in New Delhi. Sikh devotees said Pakistan President Pervez Musharraf had mooted such a proposal in 1999. "General Mushrraf had proposed in 1999 that we could give a corridor to the pilgrims here, that is, an open border, no passport, no visa. Pilgrims can come in early at sunrise and go back by evening. It will be very good for the people here, it will be good for the relations between the two nations," Pritpal Singh, coordinator, American Sikh Gurdwara Parbandhak Committee, said on Sunday. 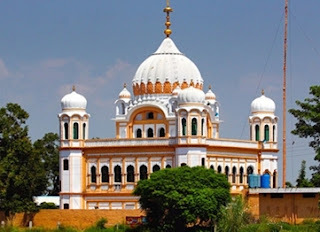 The proposed 2.5-kilometer corridor would connect Kartarpur Sahib in Pakistan to Dera Baba Nanak shrine in India. Sikh religious guru, Guru Nanak spent his last 17 years in Gurdwara Kartarpur Sahib on the banks of the river Ravi. Mandeep Kaur, a Sikh devotee said if the proposed corridor became a reality it would greatly improve relations between the two nations. "It will be very good for us, for the relations between the two countries, for the Indians living here also it will be of great benefit. No visa, No passport. It's very nice," she said. At present, India allows Sikhs to visit shrines in Pakistan four times in a year on special occasions. There are more than 170 Sikh shrines in Pakistan but Islamabad allows Indian Sikh pilgrims to visit only a few of them. The leaders of India and Pakistan held more than two hours of "very businesslike and positive" talks on Sunday to advance their peace process after watching the start of a cricket match between their national teams. The talks came a day after Pakistan President Pervez Musharraf arrived in India for his first visit since a failed summit in 2001 and near war over Kashmir three years ago, saying he had come with a message of peace.